Man these days have been hectic... work... then friends coming in for SXSW... dude I can't wait for the weekend to start... I wanna start roaming around and getting stupid. 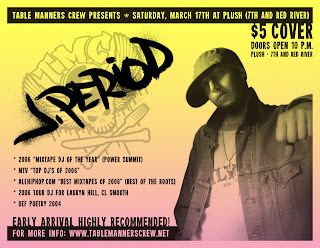 So this Saturday, March 17th @ Plush will be a real treat... J. Period and Table Manners Crew! Since his award-winning collaboration with Lauryn Hill in 2005, J.Period has become widely regarded as one of the hottest DJs in the game - one who truly represents hip hop at its finest. Named SOURCE "Mixtape DJ of the Year" 2005 and nominated for "Mixtape DJ of the Year 2006", J.Period has made an artform out of the mixtape, collaborating on Official Mixtapes with Grammy winners Kanye West, Mary J. Blige, The Roots, Nas, The Isley Brothers, Big Daddy Kane, CL Smooth and more. J.Period has also recorded with The Fugees ("Take It Easy"), Mary J. Blige, Zion I, CL Smooth, and Rakim. As a performer, J.Period has toured as Lauryn Hill's DJ, with Def Poetry 2004, and SCION 2005 & 2006. J. has also performed at Kanye West's 2006 Grammy Afterparty, The Tuff Gong Launch f. Ziggy & Damien Marley, P.Diddy's 2004 White Party and more. His compelling list of accolades includes: MTV Mixtape Mondays "Top 10 of 2005," SCION National DJ Search NY Champion 2004, Elemental Magazine "Mixtape DJ Rookie of the Year 2003," and "Mixtape of the Year 2003" (Best of Big Daddy Kane). Whether mixtape or club, behind the boards or behind on the decks, rookie or veteran, J.Period is simply one of the hottest DJs in the game - like the name says - PERIOD.